Poultry farming is one of the highly growth oriented sectors in the agriculture and allied industry. If you are a participant in this industry and looking to expand the scope of your business, Blue Mail Media’s Poultry Farming Industry Mailing List can shore up your multi-channel marketing campaigns in a significant way. Our Poultry Farms Email Database has been prepared through a stringent process of data collection, verification and update to make sure you get the best data at all times. Blue Mail Media’s Poultry Farms Mailing List gives you access to complete marketing information to connect with your target audience via telephone, email or mail. Reasoned to our well-established presence across the US, UK, Canada, Russia, China, Europe, India, Australia, New Zealand among other regions, we can serve our clients without any geographical barriers. 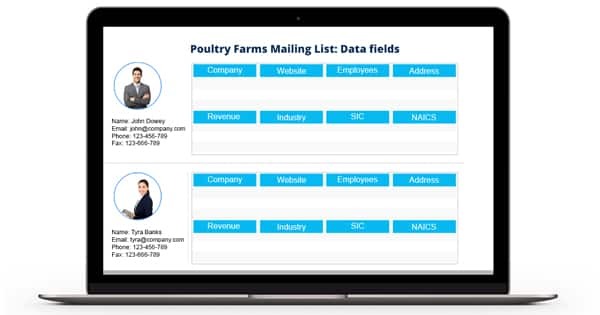 Blue Mail Media offers enough flexibility to its clients to choose from our pre-packaged mailing database of poultry farms or get a customized list based on their business specific objectives.